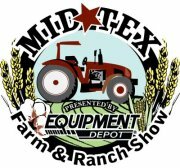 Deer Creek Structures is pleased to announce that we will be attending the 2013 Mid-Tex Farm and Ranch Show at the Extraco Events Center in Waco, Texas. The annual event is a collection of the latest farming and ranching equipment, as well as seed chemicals and AG services and technology. We are pumped to be showcasing and discussing our work! Excitingly, admission is free, giving attendees a unique opportunity to learn more about the latest technologies, innovations and cool products in the industry. Attendees travel from all across Texas and the surrounding states to catch a firsthand look, and speak to some of the leaders in various fields. The event will occur February 4th and 5th, with hours of 8:00am-7:00pm on Tuesday and 8:00am-5:00pm on Wednesday. Guests can also attend a seminar from renowned wildlife biologist Gene Naquin, which will take place on February 5th at 7pm. It should be a wonderful two days, and again admission is free. We are looking forward to it and hope to see you there!